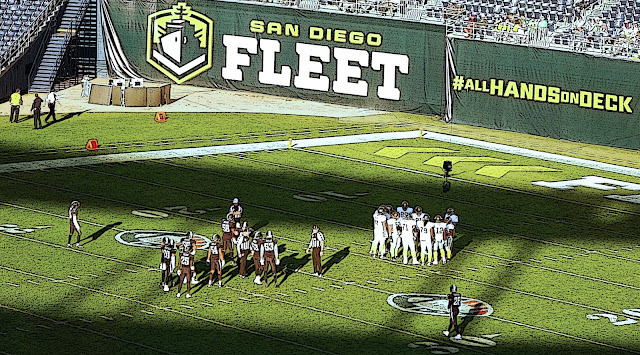 SDCCU STADIUM (03/17/2019) Last week, the San Diego Fleet (3-3) became the first team in The Alliance to win on a score as time expired. Last night, the Birmingham Iron (4-2) returned the favor with a buzzer-beating 44-yard field goal by Nick Novak, handing the Fleet its first-ever home loss. Dontez Ford became the first player in Fleet history to cross the 100-yard receiving mark with his three-catch, 183-yard performance. Ford left the game in the third quarter with an ankle injury and did not return. Birmingham quarterback and Chula Vista native Luis Perez threw for a career-high 359 yards, going 27-for-49 with three touchdowns and two interceptions. Next week the Fleet will kickoff a three-game road slate when they visit the Arizona Hotshots.